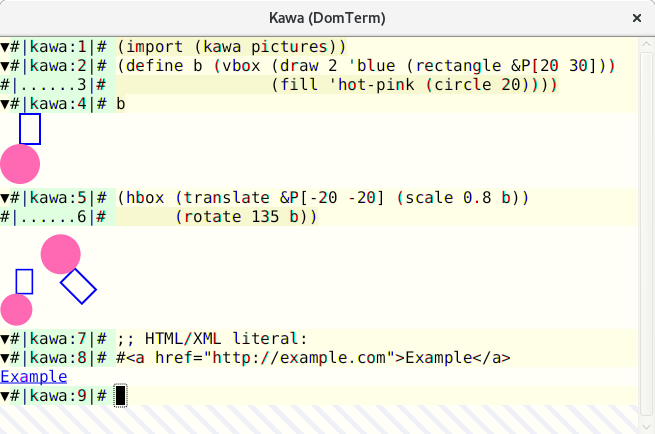 Learn about DomTerm, a terminal emulator and multiplexer with HTML graphics and other unusual features. 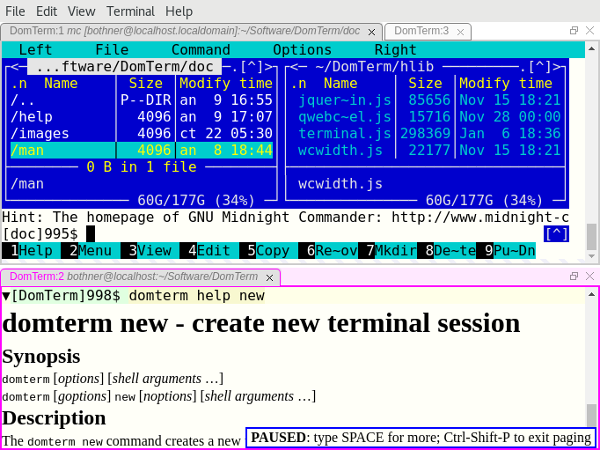 DomTerm is a modern terminal emulator that uses a browser engine as a "GUI toolkit." This enables some neat features, such as embeddable graphics and links, HTML rich text, and foldable (show/hide) commands. Otherwise it looks and feels like a feature-full, standalone terminal emulator, with excellent xterm compatibility (including mouse handling and 24-bit color), and appropriate "chrome" (menus). In addition, there is built-in support for session management and sub-windows (as in tmux and GNU screen), basic input editing (as in readline), and paging (as in less). Image 1: The DomTerminal terminal emulator. View larger image. Below we'll look more at these features. We'll assume you have domterm installed (skip to the end of this article if you need to get and build DomTerm). First, though, here's a quick overview of the technology. 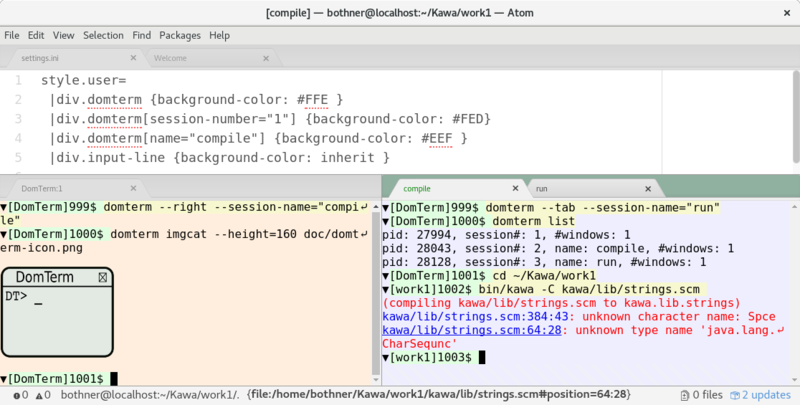 Image 2: DomTerm terminal panes in Atom editor. View larger image. Currently, the Electron frontend is probably the nicest option, closely followed by the Qt frontend. If you use Atom, atom-domterm works pretty well. DomTerm looks and feels like a modern terminal emulator. It handles mouse events, 24-bit color, Unicode, double-width (CJK) characters, and input methods. DomTerm does a very good job on the vttest testsuite. Show/hide buttons ("folding"): The little triangles (seen in image 2 above) are buttons that hide/show the corresponding output. To create the buttons, just add certain escape sequences in the prompt text. Style the terminal using CSS: This is usually done in ~/.domterm/settings.ini, which is automatically reloaded when saved. For example, in image 2, terminal-specific background colors were set. The image 3 shows a fragment from a gnuplot session. 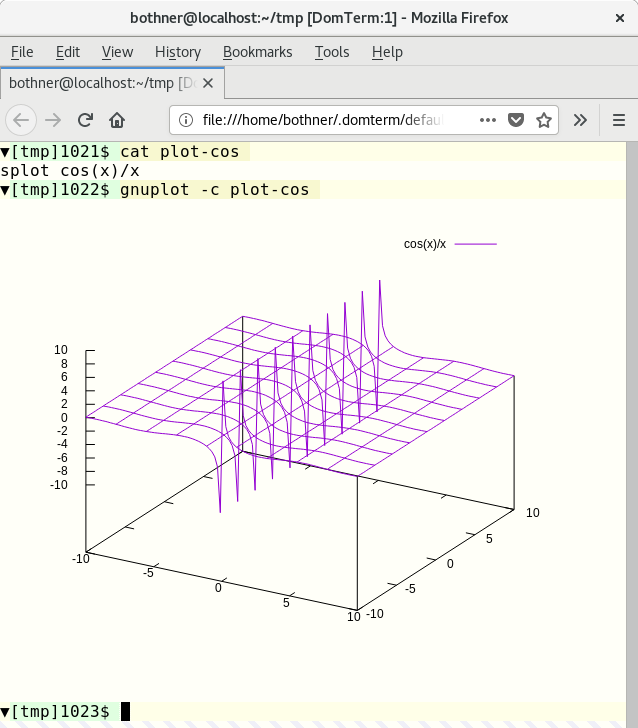 Gnuplot (2.1 or later) supports domterm as a terminal type. Graphical output is converted to an SVG image, which is then printed to the terminal. My blog post Gnuplot display on DomTerm provides more information on this. Image 3: Gnuplot screenshot. View larger image. The Kawa language has a library for creating and transforming geometric picture values. If you print such a picture value to a DomTerm terminal, the picture is converted to SVG and embedded in the output. Image 4: Computable geometry in Kawa. View larger image. Rich text in output: Help messages are more readable and look nicer with HTML styling. The lower pane of image 1 shows the ouput from domterm help. (The output is plaintext if not running under DomTerm.) Note the PAUSED message from the built-in pager. The action when clicking on a link is configurable. The default action for a file: link with a #position suffix is to open the file in a text editor. Structured internal representation: The following are all represented in the internal node structure: Commands, prompts, input lines, normal and error output, tabs, and preserving the structure if you "Save as HTML." The HTML file is compatible with XML, so you can use XML tools to search or transform the output. The command domterm view-saved opens a saved HTML file in a way that enables command folding (show/hide buttons are active) and reflow on window resize. Built-in Lisp-style pretty-printing: You can include pretty-printing directives (e.g., grouping) in the output such that line breaks are recalculated on window resize. See my article Dynamic pretty-printing in DomTerm for a deeper discussion. Basic built-in line editing with history (like GNU readline): This uses the browser's built-in editor, so it has great mouse and selection handling. You can switch between normal character-mode (most characters typed are sent directly to the process); or line-mode (regular characters are inserted while control characters cause editing actions, with Enter sending the edited line to the process). The default is automatic mode, where DomTerm switches between character-mode and line-mode depending on whether the PTY is in raw or canonical mode. A built-in pager (like a simplified less): Keyboard shortcuts will control scrolling. In "paging mode," the output pauses after each new screen (or single line, if you move forward line-by-line). The paging mode is unobtrusive and smart about user input, so you can (if you wish) run it without it interfering with interactive programs. The domterm command is also like tmux or GNU screen in that has multiple options for controlling or starting a server that manages one or more sessions. The major difference is that, if it's not already running under DomTerm, the domterm command creates a new top-level window, rather than running in the existing terminal. The domterm command has a number of sub-commands, similar to tmux or git. Some sub-commands create windows or sessions. Others (such as "printing" an image) only work within an existing DomTerm session. The command domterm browse opens a window or pane for browsing a specified URL, such as when browsing documentation. DomTerm is available from its GitHub repository. Currently, there are no prebuilt packages, but there are detailed instructions. All prerequisites are available on Fedora 27, which makes it especially easy to build. Is there a way to build this on Win7 ? I haven't yet tried. I foresee the pty handling would be the biggest problem. Using MinGW or CygWin would probably be possible. Windows 7 is a low priority, but I would like to get Windows 10 support working. That should be easier using WIndows Subsystem for Linux. I recently created a fork of the Theia IDE (see https://github.com/PerBothner/theia) using DomTerm as the terminal emulator. That fork uses the node pty support, which I believe should work on Windows, though I have not tested it. I have succeeded in porting DomTerm to WSL (Windows Subsystem for Linux). (This of course is Windows 10-only.) This works pretty good, though the only tested/working front-end is the Win32 Firefox browser. Build instructions are on the DomTerm home-page.